SYNOPSIS: A rare additon to the study of Australian History. Made in 1972, Ningal - A'Na records the events surrounding the establishment of the Aboriginal tent embassy on the lawns of Parliament House. 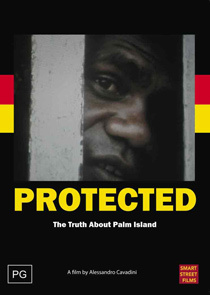 It incorporates interviews with black activists, the work of the National Black Theatre, Aboriginal Legal Service and Aboriginal Medical Service, plus footage from the demonstrations and arrests at the embassy. This is the only film to focus on the tent embassy and is an historic document, integral to comprehension of the Aboriginal political struggle. Erection of the tent embassy on the lawns of Parliament is the most symbolic action ever taken by Aboriginal people in their struggle for justice in their own land. 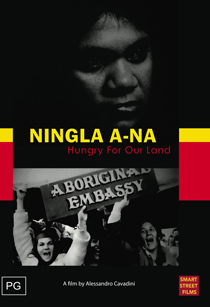 Ningla A-Na presents an inside view of Aboriginal political life. 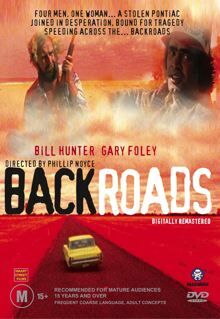 A film which should be seen by all Australians. Further Research: Gary Foley's Koori History Web site - a massive resource. "The single most important film on the Aboriginal political struggle in the last 50 years" Gary Foley, Historian, Former Curator Aboriginal Collection Museum of Victoria, Lecturer Education Faculty Melb. Uni. Subject area Independent australian documentary/ Indigenous issues/ Land Rights/ Reconciliation.